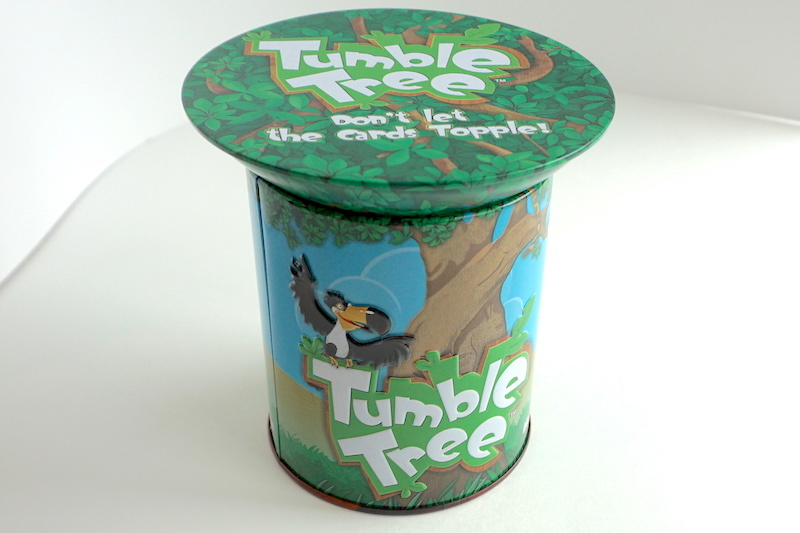 Tumble Tree is a dexterity card game published by Blue Orange Games, also known as Baobab outside the United States. The concept behind Tumble Tree is quite simple: each turn, place 1-3 cards onto the tree, and avoid knocking cards off. Each type of card has different restrictions on how it can be placed. Put Foliage (leaf) cards anywhere, but Flowers and Monkeys must overhang the tree. Leopard cards must be “slammed” onto the canopy, Bats must be dropped with your eyes closed, and Toucans must be tossed, like a flying disc, onto the tree from at least 1 foot away. Slip in a Snake between two other cards already on the tree. Bees are the hardest card to work around: once they are placed, no animal may touch them! They must be covered by Flower or Foliage cards. Players must keep any cards they knock off the tree. At the end of the game, the player with the fewest cards in their penalty pile wins! 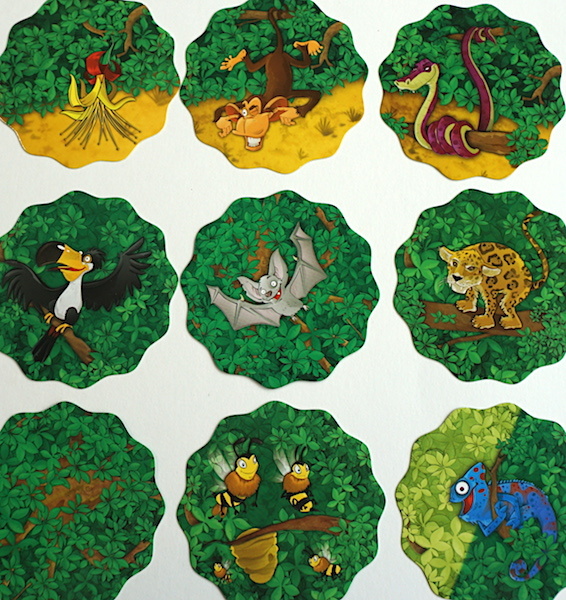 As with most dexterity games, the fun of Tumble Tree is the players’ reactions, especially to tricky card placements. The cards are cute and clearly marked, but we didn’t find the art style compelling. The full deck consists of 108 cards, which is supposed to be dealt out evenly among all the players. We found this tedious and the games we played this way felt too long; Tumble Tree moved much faster when we started each player with 20 cards instead. Tumble Tree is a game that is very easy to learn (even our three year old understood the basic concepts), with no reading required once the rules are understood. The card(s) for each turn are simply pulled off the top of the player’s deck, so there really isn’t any strategy involved in planning which cards to use. Nevertheless, it makes for a nice diversion; Tumble Tree rewards concentration and coordination, as well as not taking oneself too seriously. There’s a lot to like here, with Tumble Tree offering an immediately understandable game for many ages, but we found the littlest ones, though they understood the rules, had difficulty with the dexterity requirements. Tumble Tree is a bit harder than it looks. This can lead to frustration for young players, but older players could embrace this challenge. We think it’s a little bit of a miss, given the target age range of the game (they could have made the cards have a little bit more texture for friction, for example) but this isn’t quite a game breaker, despite it being a little annoying. If you’re into dexterity games and you’re looking for another challenge, Tumble Tree may be right up your alley. You can pick it up at your friendly local game store, or head straight to Amazon to get it shipped to you today. 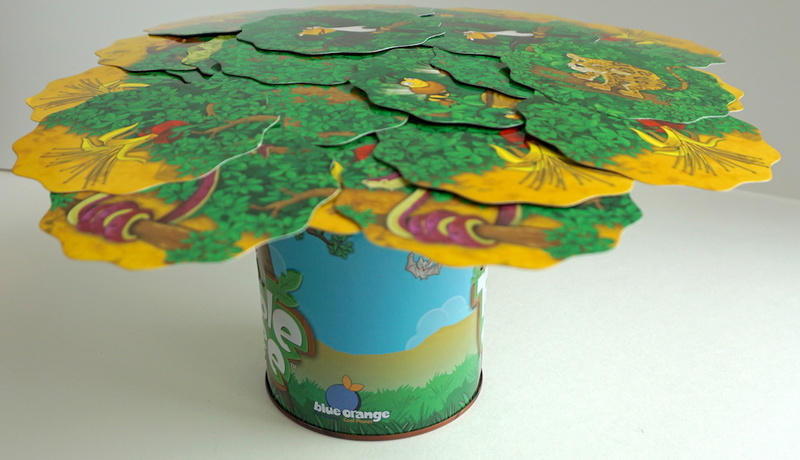 The Family Gamers received a copy of Tumble Tree from Blue Orange Games for this review.